Lets face it: it’s sick season. If you aren’t sick, chances are you know someone who is. There is a cold circulating through my group of friends at the moment and the only thing I can think of to make everyone feel better is a nice, healthy soup. As we get deeper into winter, the market is getting a little smaller but there are still so many great items you can find there! 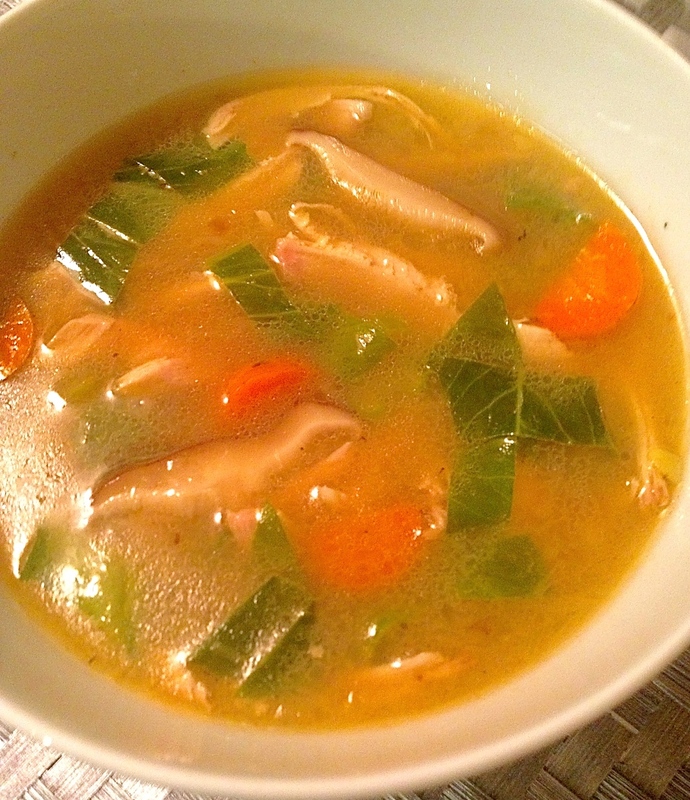 This soup uses some of those items with a few non-market elements and the result is a delicious, nutritious comfort soup that will feed even the worst colds! I wanted to use mushrooms with some great health benefits, so I chose shiitake. 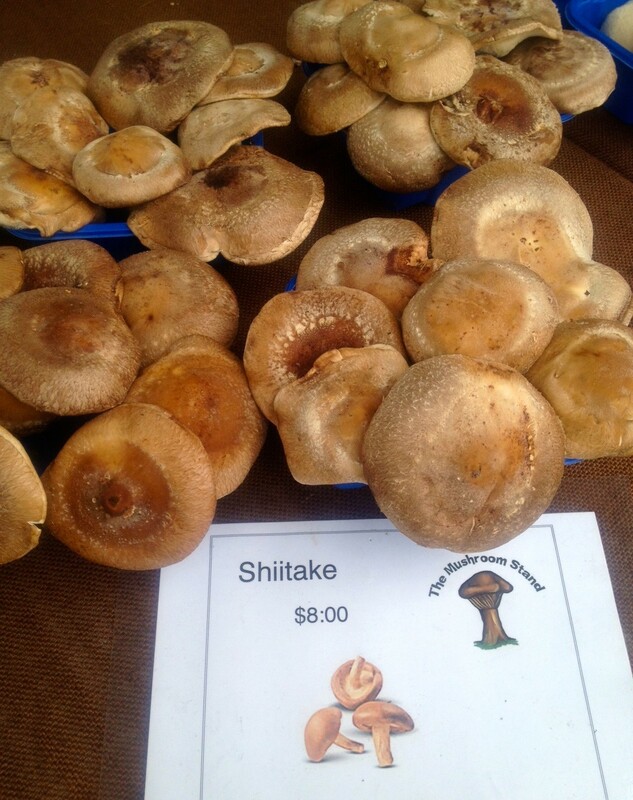 Shiitakes have been used for centuries as an immune system booster. Recent studies have shown that they have numerous properties that help to prevent against cardiovascular diseases. They are also a very good non-animal source of iron. This is great news for vegetarians, who might have a hard time getting enough of the iron that they need to stay healthy. 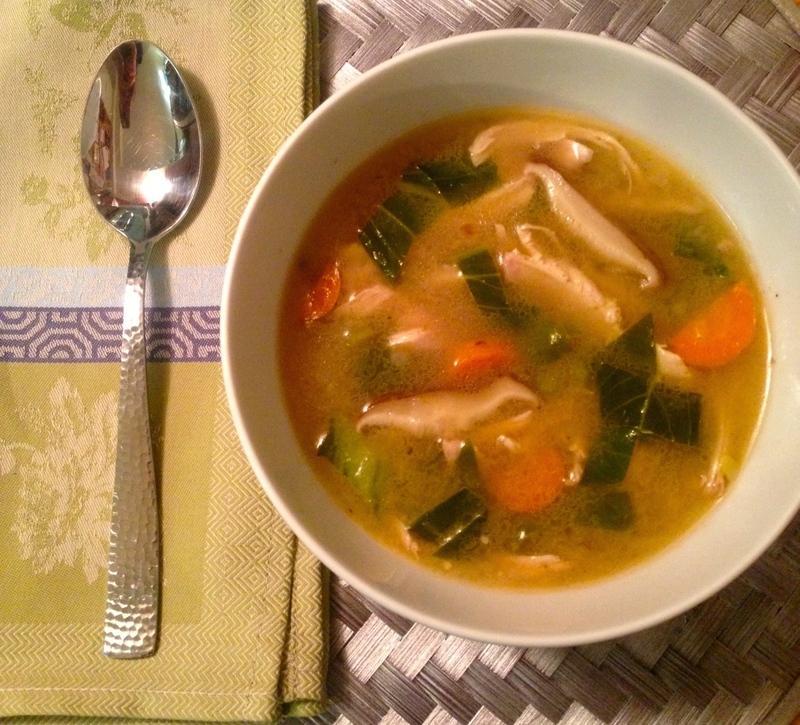 I chose bok choy for this soup because this veggie has a lot of health benefits as well. This increasingly popular member of the cruciferous vegetable family (which also includes broccoli, kale, cauliflower, and cabbage) is an excellent source of omega-3s and the mineral zinc. Bok choy also has a great beta-carotene content, which ranks it very high on the list of veggies with strong vitamin A properties. This is definitely a vegetable that you want to include in your diet as much as possible! As always, I’ve included where I purchased my produce from each vendor at the market. I chose a bone-in chicken breast because I like the flavor that roasting it on the bone brings to the meat. Bone broth from Painted Hand Farm is available in pork, veal, chicken, and beef. I chose beef because I like the flavor combination of beef and mushrooms. 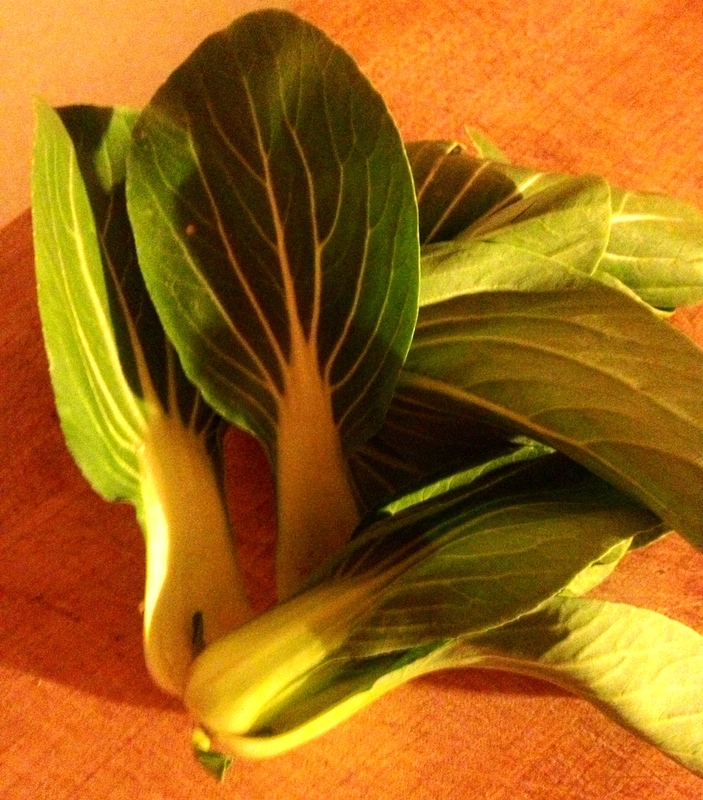 I’ve also added some optional Asain ingredients that I think work really well with the mushroom/bok choy combination. These can be omitted, although they really give the soup an added kick. Preheat the oven to 350. Wash and dry the chicken breast. Place in a oven safe dish, rub with 3 tablespoons of oil, salt, and pepper. Roast in oven until the internal temperature (measured using a meat thermometer) reaches 165, about an hour. Put aside to cool. Meanwhile, place the remaining 2 tablespoons of oil (and the sesame oil, chili oil and rice vinegar, if using) in a large stock pot with the onion and garlic until the onions are translucent, about 10 minutes. 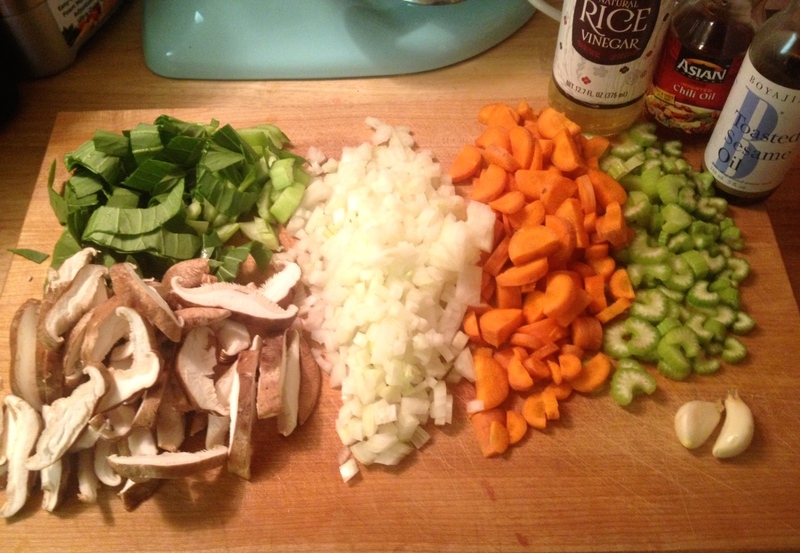 Add broth, carrots, celery, and mushrooms and bring to a boil. Add the bok choy and simmer for 5 minutes. When the chicken has cooled, shred it with your fingers into the pot. Make sure to get every delicious piece of meat off those bones! Serve warm. There is no better time for comfort food than the holiday season…and the weather outside hasn’t been too frightful, so the farm market is filled with an abundance of fresh, delicious produce for you to bring to your holiday table. As I was considering what kind of recipe to write up for the week before Christmas, it dawned on me that I should discuss the matter with some of the vendors. They’ve all got great ideas for how to use farm market goodies and I love to pick their brains. 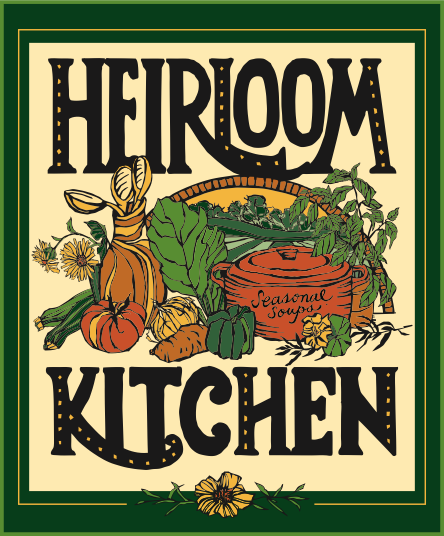 This particular recipe came to me from Christine Ilich, the owner of Heirloom Kitchen. Christine makes unbelievable soups using veggies from her garden at home and from other farmers at the market. In the summer, she makes an incredible Watermelon Gazpacho and an English Pea soup. Her specialties this time of year include Spanish Chickpea and Bermuda Red Bean soups. I’m even eating some of her Winter Veggie soup as I write this post! Christine is a trained pastry chef and recently experimented with combining her love for soup-making with her old love for pastries and hence, this recipe was born. 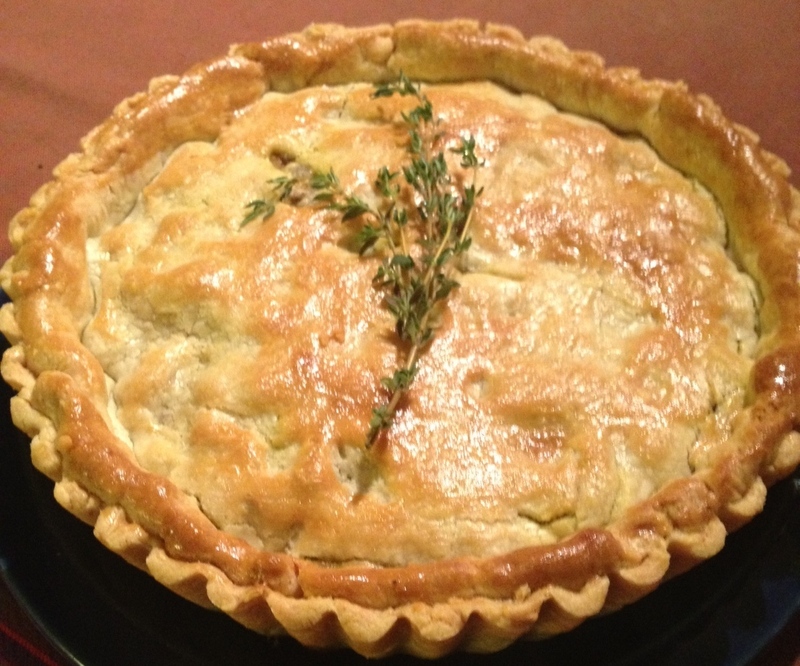 It’s a perfect amalgamation of fresh, seasonal produce and a buttery, flaky pastry crust. You can use a store-bought crust to make things easy, but I’m also happy to share Christine’s recipe for pie dough – shoot me an email and I’ll send it your way! This recipe can also be used as a side dish or served on top of rice or pasta. I promise you, though, once you’ve tasted it, it will quickly become an all-time favorite during the cold, holiday season. As always, I’ve included where I got my ingredients from at the market. *I would recommend freezing one pie uncooked and cooking the other, unless you’ve got a large crowd! Assemble pie crust first then set aside in refrigerator to chill. Preheat oven to 400. Toss diced butternut squash with a few tablespoons of olive oil and season lightly with salt and pepper. Place on nonstick (or parchment-lined) cookie sheet or shallow roasting pan in single layer. Bake in 400-degree oven until lightly browned and tender. This takes about 40 minutes. Take out and set aside. In a heavy-bottomed medium saucepan over medium heat, sauté carrots, celery, onion and garlic in olive oil until tender (add a little water to the mix to soften veggies and prevent them from browning too fast – water will evaporate out). Add mushrooms and herbs and cook a few more minutes until everything is tender. 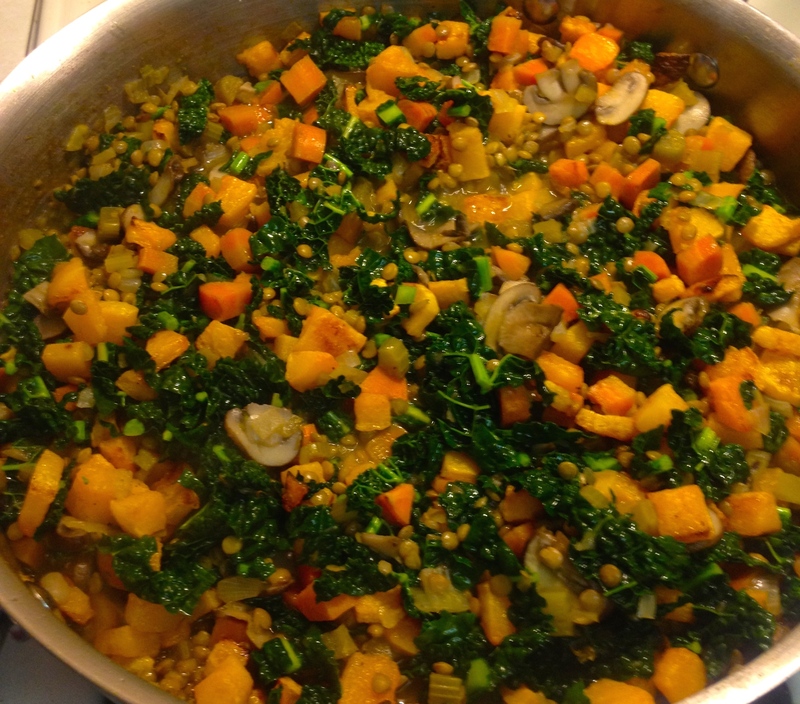 Add lentils and liquid (water or stock) and cook until lentils are tender, about 30 minutes. Add more water and cook longer if necessary to cook lentils through and make a thick-soup consistency. Add kale and cook until just wilted. Season generously with salt and pepper. Add cooked butternut squash to the mixture and place in refrigerator until mix is chilled through. Divide filling between two pie pans, dot with butter and top with crust. Chill again until dough is firm and very cold. Preheat oven to 350. Beat the egg and use to brush the top of the crust. Bake pies until filling is bubbly and crust is browned, between 50 and 60 minutes. Allow pie to cool at least 20 minutes before cutting and enjoying! So there you have it. Easy as pie and quite a good use of the season’s treats! 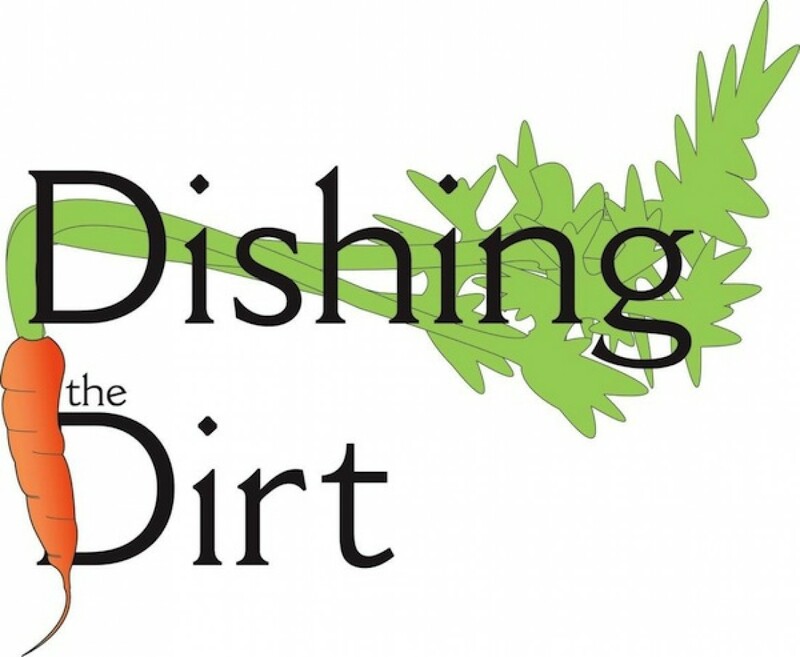 Please feel free to send me any recipes or pictures of dishes that you’ve made using farm market ingredients! 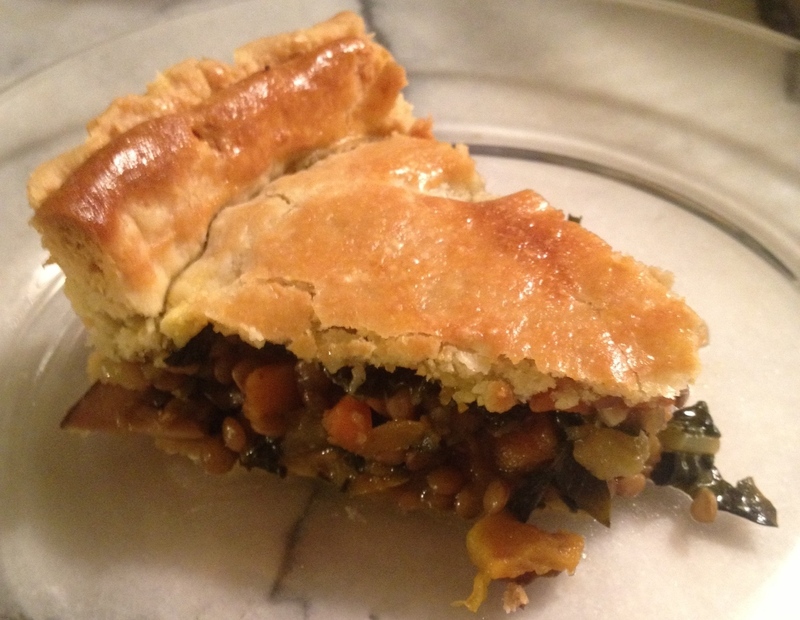 A few weeks ago, I sent out a request for wintery Farm Market recipes from my readers. Of the entries received, I’ve chosen what I think is a fabulous, simple recipe to share with you. This recipe for Mushroom Soup, sent in by market-goer Penny Glover, is a perfect mix of fresh ingredients and easy techniques. 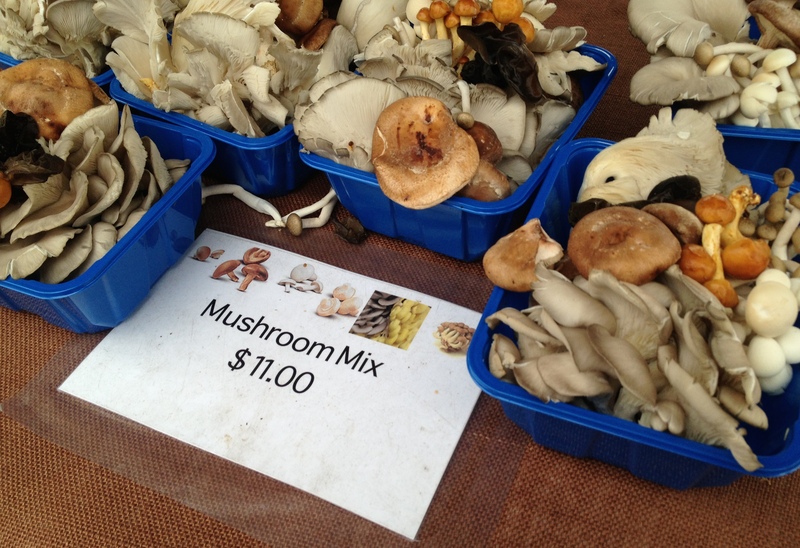 The essential ingredients (mushrooms, onions, potatoes and garlic) can all be purchased from vendors at the market. Other ingredients such as fennel seed and crushed red pepper are available at your local grocery store. 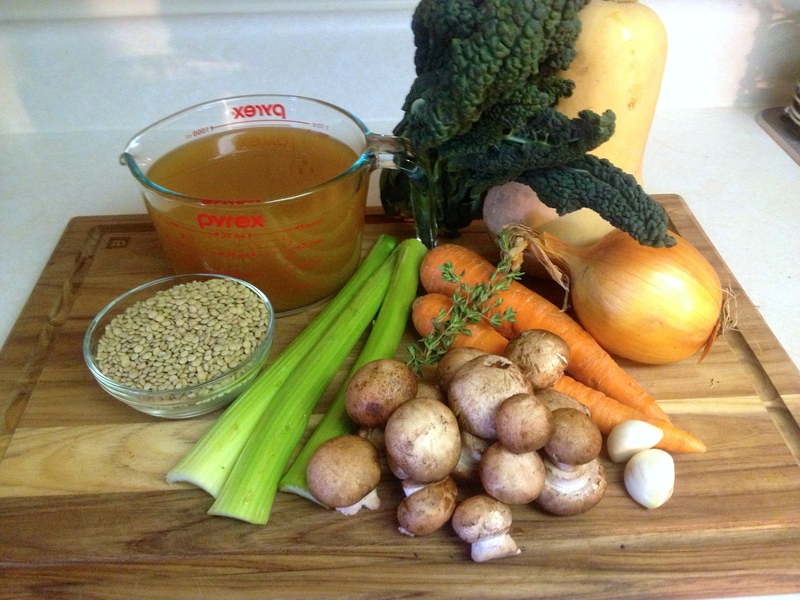 This Sunday I will be making this soup at the market and giving out samples. Each ingredient comes from a different vendor (which I have noted in parentheses). Knob Hall Winery will be joining us that day, so I’ll use their red wine. 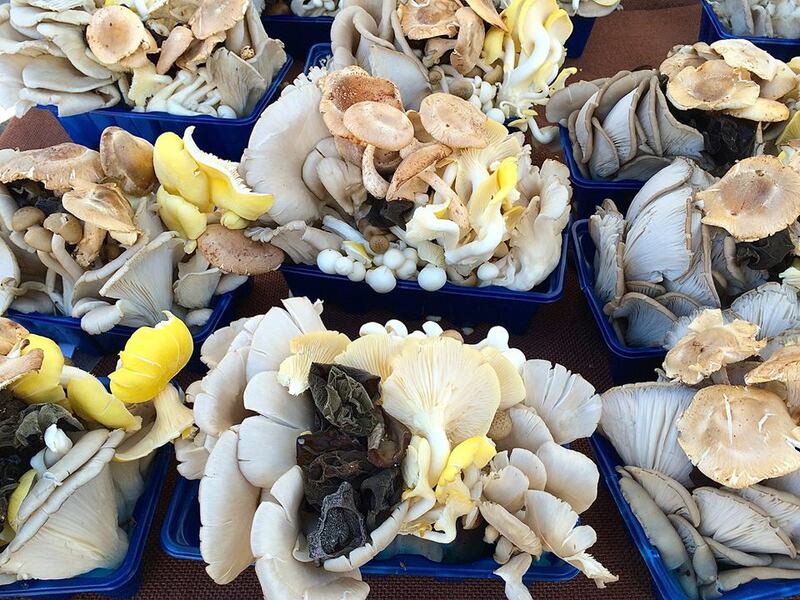 Mushrooms are the star of this recipe and The Mushroom Stand’s assortment is the perfect option for anyone unsure of which fungi would work best. *For those wanting to add a bit more flavor, Painted Hand Farm sells veal, chicken, and beef bone broth. Add fennel seeds and toast lightly. Add onion and potato and sauté until onion is translucent, about 5 to 8 minutes. Add garlic, rosemary, tarragon, crushed red pepper and a generous pinch of salt, and cook until fragrant, about a minute. Stir in red wine for about a minute and then add mushrooms. Cook until bubbling and gradually add stock and simmer for about 10 minutes. Let soup cool a little before pureeing in batches. Enjoy with a nice, crusty piece of bread or stop by Liberty Delight Farm to pick up a nice roast to serve it with! Thanks again to Penny Glover and the other readers who sent in recipes! And don’t forget to stop by the Bethesda Central Farm Market this Sunday, December 14 between 10 and 12pm to get a delicious taste of this soup!